Features lavish full-color illustrations by painter Menton3 and an introduction by Arkham House editor and noted author Robert Weinberg. This is one book that true horror fans can’t do without! 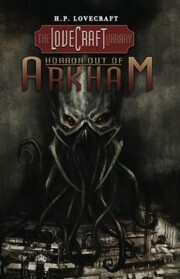 The Lovecraft Library, Volume 1: Horror Out of Arkham. By H.P. Lovecraft, with an Introduction by Robert Weinberg. New York, NY: IDW Publishing; October 2011; ISBN 978-1-61377-026-9; hardcover, 232 pages.